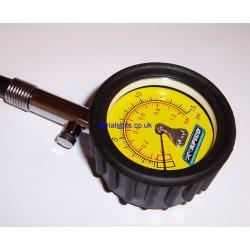 A nice quality low pressure tyre guage available in two versions, 0-15 p.s.i and 0-30 p.s.i. It has a substantial rubber housing to endure knocks and bumps. The gauge colour may vary.